In 1979, Mierle Laderman Ukeles set out to shake the hand of every garbage collector in New York City. It took eleven months to acknowledge 8,500 employees for their oft-thankless service. “Touch Sanitation” is perhaps the best representation to date of Ukeles’ dedication to what she calls “maintenance art,” or art based around routine, everyday activities. 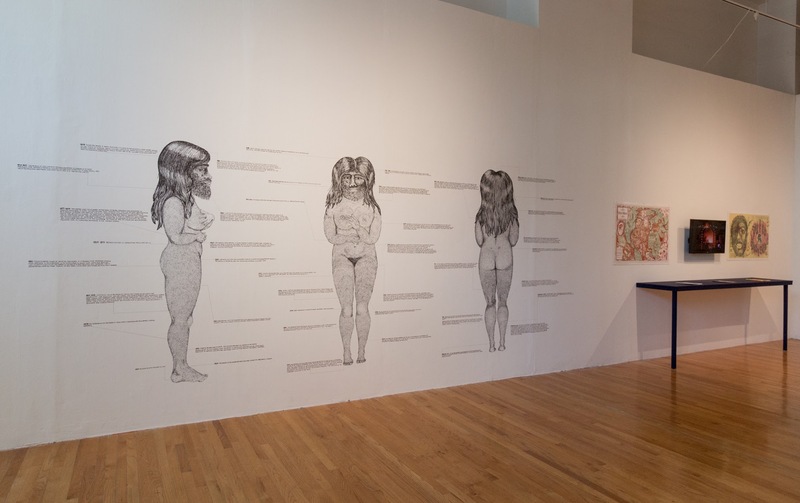 Ukeles’ socially engaged art practice is at the crux of “Revolution at Point Zero: Feminist Social Practice” at Columbia College’s Glass Curtain Gallery. Curators Neysa Page-Lieberman and Melissa Hilliard Potter note that Ukeles is one of the first people to clearly produce work connecting feminism and social practice. After all, the New York City-based artist turned toward “maintenance art” as a new mother, frustrated that her artistic heroes, like Jackson Pollock and Marcel Duchamp, didn’t have to worry about balancing domestic tasks with their artistic practices. Social practice, a hot topic in the art world, is a medium that blends performance and activism. The works on view here broadly encompass the genre. Besides Ukeles’ “Snow Workers’ Ballet,” a beautiful 2012 video documenting a synchronized movement of snow-removal vehicles, all of the pieces have been commissioned for the exhibition. And all of the pieces have some participatory element, and some, like Megan Young’s “Longest Walk,” encourage engagement from gallery visitors. Young collaborated with Chicago-based artist Angela Davis Fegan for the work, which was originally conceived as a performance piece staged during the 2016 Republican National Convention. For that iteration, twenty-five female-identifying people carried protest signs during the convention in Cleveland, moving in a choreographed, cyclical pattern. For every eight steps the participants took forward, they moved six steps back, in an effort to emphasize the slow progress of social change. The original posters and photos from the performance are on view here, as well as new protest signs made especially for this exhibition. Gallery visitors are induced to pen their own message on one of Fegan’s posters, which read “We hold space for:____” On April 22 and 23, during the Open Engagement conference, Young will stage several more iterations of the performance using local activists. “Chicago is really one of the leading cities in the world for social practice,” Potter says, although little attention has been paid to its feminist legacy. Potter and Page-Lieberman, who both work at Columbia, previously collaborated on “Not Ready to Make Nice: Guerrilla Girls in the Artworld and Beyond,” a show that also explored feminist art and social practice. “We felt that based on our artistic and curatorial practices, we really had something to bring to the table,” Potter says. “Many people, and not just women-identified artists but lots of artists, are still identifying a feminist practice in their work but it’s not really rising to the level where it’s becoming the mainstream dialogue yet,” Page-Lieberman says. To draw attention to the natural overlap of feminism and socially engaged art, the curators have displayed several definitions of both terms. 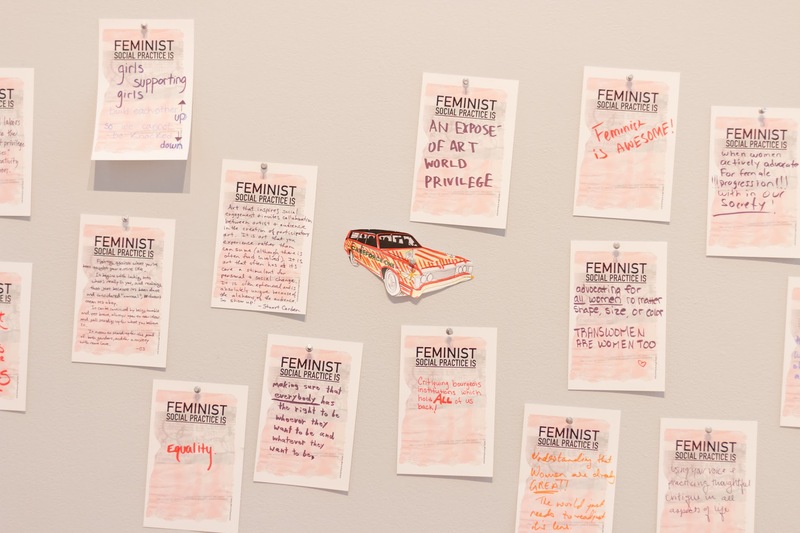 They then offer wall space for viewers to define feminist social practice for themselves.